​Work has started on a new single-site secondary school for Glossopdale Community College following our £21.7m investment. DCC’s Deputy Cabinet Member for Children’s Services Councillor Damien Greenhalgh (left) and Cabinet Member Councillor Jim Coyle (second right) celebrate the start of work on the new Glossopdale Community College with head boy Tyler Halton and head girl Isabel Townend, Principal Steve Playford (third right) and Henry Brothers Midlands Managing Director Ian Taylor. Midlands-based Henry Brothers is building the school which is scheduled to be completed in two phases over the next two years. 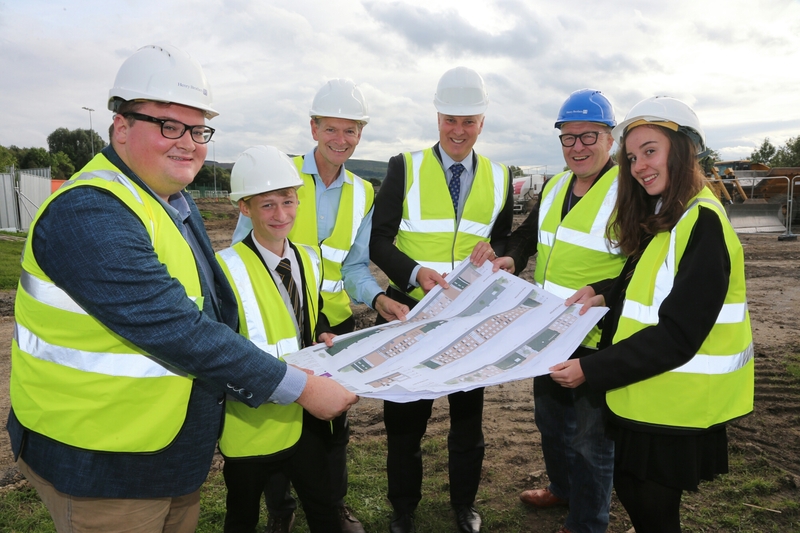 “We’re delighted that work has started on Glossopdale Community College’s fantastic new single-site school. “Despite facing unprecedented cuts and huge financial pressures we’re working hard to provide our young people with the facilities they need to help them thrive and learn in a positive environment and we’ll continue to do what we can within a tight budget to invest in our communities to make our schools fit for the 21st Century. The council consulted on plans for a new school after revealing many parts of existing buildings were in poor condition with estimated repair bills totalling more than £5m. Following a public consultation it was agreed last year to go ahead with proposals to merge the school’s three separate sites onto Newshaw Lane, Hadfield. “The Glossopdale community is really excited that the construction of the new school building has started. “Our determination for improvements is shown through our vision of creating ‘an outstanding learning centre at the heart of the community. College head boy Tyler Halton and head girl Isabel Townend were invited to see the start of the building work to represent current pupils and future generations who will benefit from the new school. Part of the funding for the new single-site school will come from the sale of the Talbot House site and the Upper School site, both on Talbot Road in Glossop. Pupils from the Hadfield site are due to start moving into the new building in spring 2018. It was great to meet the euthusiastic young Health and Social Care students from Glossopdale Community College today, who had been working with Volunteer Centre Glossop on a personal safety project in their lunchtimes and even over the holidays. The project, funded through Derbyshire CC’s locality funds, aims to improve the health of young people with a particular emphasis on personal safety and developing safer communities for young people. 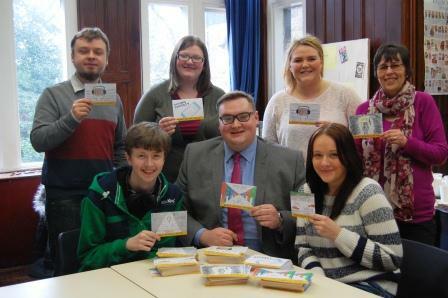 There was some great artwork and ideas how best to spread the message to other young people in the area. So look out for their information postcards around the town!